This book is a compilation of recipes using a slow cooker, aimed at people who want a meal in a hurry, and are prepared to put a little time into preparation in advance. There is an emphasis is on saving time; the idea is that preparation time is reduced to a minimum, and meals are available when you want them. An ideal arrangement for people who don't want to eat out or by takeaways but who find the time involved in preparation a barrier to cooking. Recipes are also developed to be healthy and inexpensive, so this is a recipe book with wide appeal. The recipes are the result of a year long experiment. 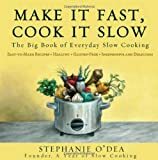 In 2008, the introduction informs us, author Stephanie O'Dea decided to use her slow cooker every day for a year. The story is reminiscent of Julie Powell's exploration of Mastering the Art of French Cooking in 2002. Like Powell, O'Dea maintained a blog of her experiences, and you can find many of the recipes on her website. Powell's inspiration was a successful crème brûlée, something she didn't believe possible. An email to the Rachael Ray TV cooking show brought an interested response, and pushed Powell to consider a book of recipes. The book has an accessible format, divided into sixteen sections (beverages, breakfast, meat etc). There is a vegetarian section and others on side dishes, desserts, and baking. Each recipe accompanied by O'Dea's verdict. These are chatty little paragraphs that personalize the book as well providing a few additional hints. The presentation of recipes is clear, and the instructions are straightforward. Production costs have been kept to a minimum by excluding photographs, but you can see pictures on the website. That gets around one of the problems of recipe books, cost. If you're not used to using a slow cooker, O'Dea provides a brief guide in her introduction, including advice on choosing the right cooker for your needs. I can recommend the Moroccan lentil soup, especially for the winter. It may be a little hot for some tastes, but it's very tasty, and definitely easy to prepare. I wasn't so keen on the sun-dried tomato dip. The taste was fine, but two hours in a slow cooker hardly seemed worth it to combine two ingredients. There are plenty of recipes to choose from and my sense is that those that combine a lot of ingredients where different flavors need to blend will be the most successful. If the idea of slow cooking appeals its worth exploring O'Dea's website. You can try a few recipes and decide if you want to add this book to your collection.